Just a FYI folks. Kien Giang has been closed for a "long time coming" renovation/makeover, but has just re-opened yesterday Saturday February 21st. I was hankering for a bowl of vermicelli with charbroiled pork and an eggroll, and was going to settle for 2nd best when we saw the OPEN sign lighting Kien Giang's window. We have fallen into a rut of what we order here, and the list is fresh unfried spring rolls, savory shrimp pancakes and lettuce leaves, vermicelli with charbroiled pork or shirmped, banh mi (Vietnames po boy), lemonade and iced coffee. That is it, we like these, and these are what we get. I have had some other dishes here, including some of the stir-fried dishes that mimic Americanized Chinese food, and I did not care for them. I did like the pho and hot-pot dishes. The hot-pot dish is one of the most expensive item on the list, but it reminds me of being a kid when my mom had chicken broth hot-pot (like fondue with broth). This broth is housemade broth, it is gentle, not like that over salted, mono sodium glutamate, artificially flavored canned stuff that is labeled "broth". Hot-pot is one of my comfort foods, like chicken soup is to the USA. I don't get this much unless I know people have had this dish before because the flavors are so natural or understated. The flavors are subtle, that of broth and the veggie or meat being cooked in the broth, there are not hot spicy or other flavors. I mean, you aren't going to get a lot of flavor from a bean sprout cooked in broth, but what you are going to get is really food flavor, what food is supposed to taste like. The renovation has new flooring, new central lighting, crisp white paint on the walls, and a new cold case if you want to get some takeout Vietnamese desserts. There is a little antechamber built now around the front door, so there won't be the wind, cold air or hot air, depending on the season, rushing into the restaurant now. The kareoke stage with the giant tv is finally gone, allowing for a few more tables for diners to sit. The same artwork are on the walls. My guess for this renovation/makeover is that Kien Giang was recently bought by the long-time chef from the former owner. The former owner didn't put much money into the restaurant, so that is why it was so rundown. The new owner wants to make his restaurant nice, and his employees are happy he bought the place, and wanted to spiff it up. I am happy he spiffed it up too. 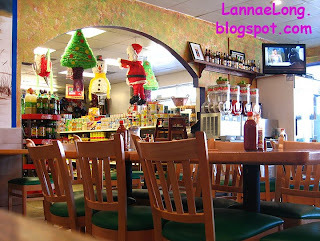 This blog post has been a long time coming for Las Americas. I tried Las Americas years ago after hearing about what Kay West wrote about this place in the Scene. Las Americas is known for being a papusaria. There are other foods too besides papusas, including tacos, soups, quesadillas, and burritos. There are sides of beans and rice and other sides normally associated with Mexican foods. To drink, they have coke products and other Mexican sodas. There is one dish that I really want to try, and it is a red posole style soup. The soup is supposed to be assundry parts of the pig and hominy in a red broth. The last few time I have been there, I have gone on the wrong day, and they did not have soup. I will have to go back, on other days to see if the pork and hominy soup is the soup of the day. The reason way I haven't blogged about this place before is because I have been ordering all wrong, that is to say, ordering way too much food, and then feeling overwhelmed. The 1st time I was there, I ordered 2 papusas, beans and rice, all totaling less than $10. How could this been too much food, as it was less than $10. Well, my dining companion ordered the same, and our table was so full of food, enough for 4 - 6 people, that we were so overwhelmed, and barely ate any of it. We packed it up and took it home, and had meals for days. We waited long enough to forget about the volume of freshly made food, and each time we ordered way too much food, and got overwhelmed. BUT, this time, we had just been to Las Americas recently, and knew that one dish per person, no matter how cheap ($2.50 per papusa) it is, is how we need to order. The papusas are huge, the size of a normal dinner plate. The papusas are corn masa on the outside filled with what meat, cheese or beans that you want, and then formed into a giant pancake and fried on the griddle until golden brown. A fresh cabbage slaw is served to put on top of the papusa. This day, we ordered one (1) bean pork and cheese papusa, two (2) tacos - stew beef and chorizo ($1.25 each), one (1) side plate of rice, and two (2) sodas. This is more food than the 2 of us could eat for lunch. The papusa was slightly crunch on the outside and densely filled with beans, pork and cheese. The tacos were of the style you can get at a taco cart. 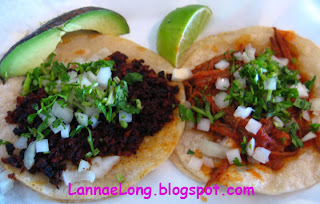 They are made with soft corn tortillas topped with the meat, onions and cilantro. A spritz of lime on the taco, and it is heaven. I prefer this sit-down restaurant for eating the tacos because I feel like I can take my time to dine on the tacos. I love taco truck food a lot, but somehow I rush through those meals standing outside. I must mention that all this food for 2, including 2 drinks, and tax, the total was only $9.75. Yes, less than $10 for 2 for a quite filling lunch, drinks and tax. Amazing! A note hear about the sodas, and the ingredients in the sodas: We got a coke and a diet coke with lunch. The diet coke was the standard coke made with that blue sweetener. The coke, however, was made in Mexico, like the other sodas such as Jarritos brand soda. The Jarritos brand sodas are made with sugar, not with corn syrup. The sugar adds a crispness to the soda, a mid-tongue fizz that is almost lemony and bright. Sodas made with high fructose corn syrup is missing this fresh zip on the tongue and the fresh brightness you can only get from sugar. The coke at Las Americas was so crisp, fizzy, and bright, like coke was back in the 1970s before the USA plants switched to high fructose corn syrup. I was listening to a Talk of the Nation Science Friday show, and the food authority guest speaker was saying that high fructose corn syrup is not really a food because it can't ever occur in nature on its own. You can't just leave a corn cob out in the sun and get something sweet, like you can with cane juice, you can leave it out in the sun and get cane sugar. The science is inconclusive about the effects of corn syrup on the body. Corn syrup could be found to be one of the causes for obesity and obesity related diseases. It could be like how margerine was once thought to be healthy because it is made from veggie oil. Years later, margerine and oleo is found to be a leading cause of plaque causing heart attacks, and it is healthier to eat lard and butter! Yikes about margerine! Regardless of health issues around corn syrup, I do prefer sodas made with sugar because soda with sugar tastes so much better! I need help in preparing gizzards. Feel free to offer any tips or advice on the gizzard. I have about a cup of gizzards in my freezer waiting for me to do something with them. Read on, this is my story of the gizzard. I cubed up the gizzards, and sauteed these in bacon drippings I saved from bacon from a local organic pig. I wanted the gizzards to have lardon quality to them. I then added a couple anchovies, some grated pepper and the topping was ready. I boiled up some of Lazzaroli's fettucine pasta (I love Tom Lazzaro's pasta a lot! 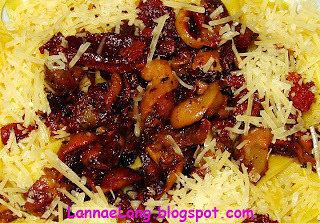 ), and topped it with the sauteed gizzards and a generous sprinkle of grated parm. The flavor was exactly how I wanted it, it had a really nice BBQ wood smoked flavor to it from th bacon drippings, the anchovies added that special umami saltiness to the dish that I really love, and of course the fresh made pasta is wonderful. The only problem was the gizzards, they were chewy, with an under cooked tendon tooth feel. It tasted great, but with a bad tough gizzard texture. This is the 1st time I have cooked gizzards. My grandmothers and my mother used to cook these things, and never made me eat the dishes they cooked with them. I took no interest in gizzards, tendons, even liver as a child, and I never watched my relatives prepare gizzards. To prepare my dish, I made a mistake in not calling my mom, and not googling gizzards for cooking tips and help. When we was in Lesmont, France, a tiny little town with only one restaurant that closes at 8 pm, I had the most delicious salad course at the tiny restaurant (will blog about this place later). The salad was a lovely bed of green lettuce, then sprinkled on top were bits of lardon, diced sauteed gizzards, and a hot poached poulet egg. When I tapped the egg with my fork, egg yolk oozed warmly over the salad making a rich sauce. The French lardon, please, there is nothing better than this version of pork and pork fat! I just can't go back to industrial packed USA bacon. The gizzards seemed to have been sauteed in the lardon fat, and had such a great tender bacon texture. I was trying to recreate this gizzard experience. The bacon source I have here in TN isn't like the French lardon, but it is good, tasty, and offers the right texture and smokey flavor. If I wanted to add an egg to the dish I have a great local organic free range egg supplier. Even the gizzards are from a good local farm. The crux of the issue is how I prepared and cooked the gizzards. Ok, please, anyone out there cooking gizzards these days? Let me know what I should do with my gizzards to make a good gizzard dish!